I was picking olives when all the winds in the world tried to knock the trees down. It has been one terror attack after the next, UNESCO and it’s rebranding of Jewish Holy sites here in Israel into Muslim ones (?!! )But the trees remain in place, weathered looking but rooted into the ground. As I write these words right now a “Rabbi” came with a group called “Rabbis for human rights” to side with the jihadists in their rants to destroy the Jewish people, to side with the sitra achra (dark side) against truth and goodness. Instead of coming into our community so distraught by the murdering of its residents, Ari Asherman has decided to come to stand with the murderers on the other side of our fence! He has also come to incite and still up turmoil- the antithesis of someone who should be OHEV SHALOM and RODEF SHALOM. Yes, the winds of insanity blow hard but they cannot uproot a people so connected to their source of vitality as it says “Eytz Chaim Hee Lamachazeekeem Bah!” (The tree of Life for those who hold unto her), as referred to the Torah and the Land of Israel. A place that may seem so surreal during this time of tremendous anxiety in Israel – of relaxation, like home from home is right under the olive trees. 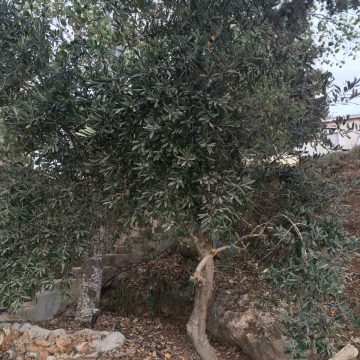 For me, a beautiful sight is an olive tree laden with plum purple and green fruit, plump and decorating the silvery green leaves under the blue sky of Israel. The feeling of bounty poured as the olives are collected into a big bin is personification of the blessing of the Land of Milk and Honey. In order to make oil though it takes a lot of olives- 25 pounds to every liter of oil. We take our olives to the olive press right here on Itamar. First the fruit are crushed into pulp, then the pulp is put under tremendous pressure as the press squeezes out the oil. The olive tree is a symbol of the Jewish people who also are “put through the grind” to come out shining and pure. In Jewish life olive oil was used to light the sacred menorah and to anoint the king and High Priest. It was used as a food sacrifice and as a people our purpose and destiny is to be a light unto the nations. Oil also does not mix and rises to the top always. Our children that adorn the table are compared to “young olive saplings”. The power and energy of the olive tree is felt in the core of your being, like standing next to an awesome individual. It can sustain on many many months of no rain or care. The oldest olive trees that are thousands of years old stand right here in our valleys. Come and see and feel them! If they could only speak and tell their testimony of how the tribes of Israel would journey to Jerusalem from here for the feasts laden with oil, the finest oil of this Land. The message of the olive tree is that NO POWER ON EARTH can put out the light! lifting special prayer to God for protection of our Itamar Friends! We love and pray for the community of Itamar! Leah, your Blog is written so well you truly have a gift, Baruch Hashem.